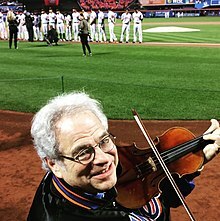 Itzhak Perlman (Hebrew: יצחק פרלמן‎; born 31 August 1945) is an Israeli-American violinist, conductor, and music teacher. Over the course of his career, Perlman has performed worldwide, and throughout the United States, in venues that have included a State Dinner at the White House honoring Queen Elizabeth II, and at the Presidential Inauguration of President Obama, and he has conducted the Detroit Symphony Orchestra, and the Westchester Philharmonic. In 2015, he was awarded the Presidential Medal of Freedom. Perlman was born in Tel Aviv to a Jewish family in 1945, then British Mandate of Palestine, now Israel. His parents, Chaim and Shoshana Perlman, were natives of Poland and had independently immigrated to Palestine in the mid-1930s before they met and later married. Perlman first became interested in the violin after hearing a classical music performance on the radio. At the age of three, he was denied admission to the Shulamit Conservatory for being too small to hold a violin. He instead taught himself how to play the instrument using a toy fiddle until he was old enough to study with Rivka Goldgart at the Shulamit Conservatory and at the Academy of Music in Tel Aviv, where he gave his first recital at age 10. He moved to the United States to study at the Juilliard School with the violin pedagogue Ivan Galamian and his assistant Dorothy DeLay. 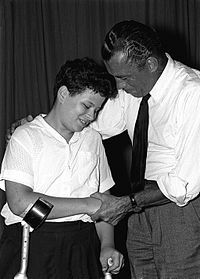 Perlman contracted polio at age four and has walked using leg braces and crutches since then and plays the violin while seated. As of 2018[update], he uses crutches or an electric Amigo scooter for mobility. On 5 July 1986, he performed on the New York Philharmonic's tribute to the 100th anniversary of the Statue of Liberty, which was televised live on ABC Television in the United States. The orchestra, conducted by Zubin Mehta, performed in Central Park. He made an appearance in Disney's Fantasia 2000 to introduce the segment Pines of Rome along with Steve Martin. On 2 November 2018, Perlman reprised the 60th anniversary of his first appearance on the Ed Sullivan Show as a guest on The Late Show with Stephen Colbert. Perlman plays the Soil Stradivarius violin of 1714, formerly owned by Yehudi Menuhin and considered one of the finest violins made during Stradivari's "golden period." Perlman also plays the Guarneri del Gesu 1743 'Sauret' and the Carlo Bergonzi 1740 'ex-Kreisler'. Perlman lives in New York City with his wife, Toby, also a classically trained violinist. They have five children, including Navah Perlman, a concert pianist and chamber musician. Perlman is a distant cousin of the Canadian comic and television personality Howie Mandel. 2016: Awarded the Genesis Prize by the Prime Minister of Israel. 2017: Subject of the documentary Itzhak directed by Alison Chernick. ^ "Israeli Violin Prodigy Admits He Likes Jazz". Proquest.com. Retrieved 1 October 2011. ^ "Perlman, Itzhak". Oxford Music Online. Retrieved 1 October 2011. ^ "Perlman, Itzhak Biography: Contemporary Musicians". Enotes.com. Retrieved 1 July 2011. ^ "'I WOKE UP AND I COULDN'T WALK': THIS IS THE POLIO THAT SHOULD BECOME JUST A MEMORY". The Jerusalem Post. Retrieved 18 May 2018. ^ "How They Roll". The New York Times. Retrieved 26 December 2014. ^ Duration: 60 min. "Watch The Ed Sullivan Show Season 12 Episode 8 Itzhak Perlman / Carol Lawrence & Larry Kert / Film: Ed Sullivan Visits Jerusalem". Ovguide.com. Retrieved 1 July 2011. ^ "Liberty Receives Classical Salute, Sun Sentinel, July 5, 1986". Archived from the original on 23 February 2015. ^ "News releases for May 2007" (Press release). The White House. 7 May 2007. Retrieved 4 September 2007. ^ Quartet pre-recorded Obama music. BBC News (23 January 2009). ^ Norman Lebrecht (3 November 2018). "60 Years On, Itzhak Perlman Reprises His Ed Sullivan Appearance". slippeddisc.com. ^ "The Perlman Music Program: Toby's Project Grows and Grows". Strings. Retrieved 1 October 2011. ^ "Perlmans' Proteges: The Perlman Music Program". Strings. Retrieved 1 October 2011. ^ "Perlman Student Stirling Trent". Strings. Retrieved 1 October 2011. ^ "The Daily Gazette – Google News Archive Search". Google News. Retrieved 3 July 2016. ^ Brownfield, Paul (21 June 1998). "New Afternoon Arrival". Los Angeles Times. Retrieved 24 July 2014. ^ "Newsweek cover story 1980". Archived from the original on September 14, 2002. Retrieved March 25, 2008. ^ a b "Perlman awards". Archived from the original on September 14, 2002. Retrieved March 25, 2008. ^ "President Obama Names Recipients of the Presidential Medal of Freedom". The White House. 16 November 2015. Retrieved 16 November 2015. ^ Phil Helsel – "Obama honoring Spielberg, Streisand and more with medal of freedom," NBC News, 24 November 2015. Retrieved 25 November 2015. ^ "Genesis Prize". Retrieved 7 May 2015. ^ Verongos, Helen T. (8 March 2018). "Review: 'Itzhak,' the Man and the Musician". The New York Times. Retrieved 15 March 2018. Wikimedia Commons has media related to Itzhak Perlman.